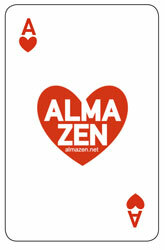 The heartbeat of Almazen is the energy and support of all those who make it possible. We invite you to join us and become part of the family! of our activities, give you discounts and you can enjoy our BAZ, a meeting place for members, open from Tuesday to Sunday. Our space is air conditioned and adapted for all kinds of public. Porque medio nos has conocido? así podrás disfrutar de los beneficios de SOCIOS ALMAZEN! Dinos que día pasaras a recoger tu carnet y lo tendremos preparado!